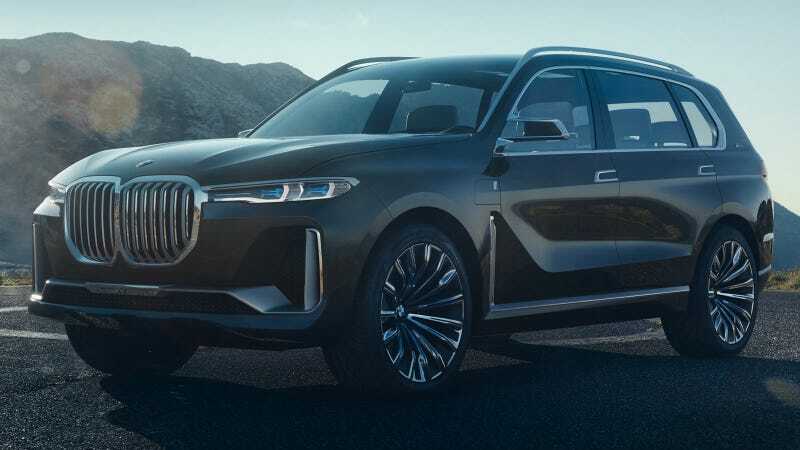 Heaven forbid BMW ever makes a full size truck, because the kidney grills on the ugly mug of this leaked 2018 BMW X7 concept are quite disturbing and don’t scale up very well. BMW finally wised up and delivered a large, three-row SUV. Despite having almost no effect on our sort of folk, BMW has finally made the obvious move it has waited so long—literally decades—to deliver on. The 2018 BMW X7 has been so obviously missing from its lineup, and now it’s leaked over on Bimmerpost just a couple of days before its reveal ahead of the Frankfurt Motor Show. It appears to have a port for charging, so we can safely assume there will be a hybrid model. The door handles look really confusing. The overall design is just the latest BMW-concept go-to look awkwardly stretched a few hundred pixels. And those look like a third set of headrests back there. There’s been an option for three rows on the X5 before, but true luxury rests in those few short extra inches added to the wheelbase only a big ugly beast like the X7 could produce. Considering this is a leak, these images may not be the final deal, but it looks pretty legitimate. It being another “leak” also means we don’t know much else about the X7 just yet, but we should expect to find out very shortly. Any suggestions for what BMW should do about those damn kidneys? It’s literally a big problem now.